Last Thursday evening, after going to Traci's work-related holiday banquet at the St. Pete Yacht Club, we walked over to the Renaissance Vinoy Resort for drinks. Getting drinks at the Vinoy after this event has become something of a tradition for us and a good excuse to visit the beautiful old hotel. The Vinoy and the Don Cesar Beach Resort on St. Pete Beach are my two favorite old hotels in Tampa Bay. I haven't had a chance to check out the Belleview Biltmore Resort, regarded as the largest occupied wood frame structure in the world, in Clearwater. While the Vinoy and Don both show their age at times, they exude a charm and elegance that most new luxury hotels can't match. 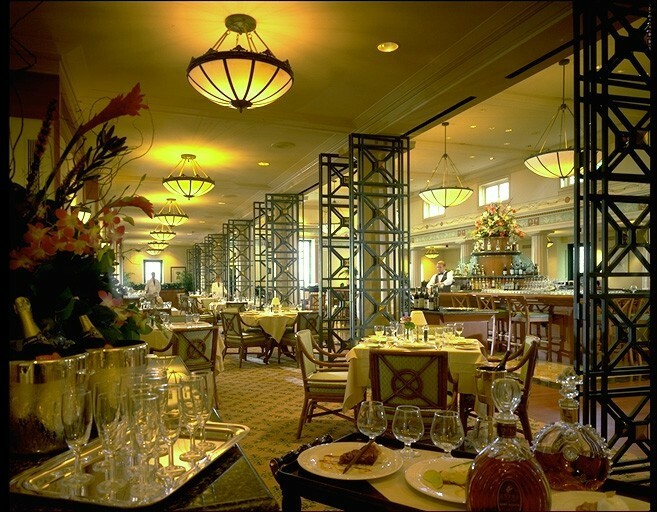 The Vinoy has a smaller side bar off its lobby and a fancy larger bar inside its well-regarded Marchand's Bar and Grill. Marchand's bar is located right in the middle of the restaurant's impressive main dining room, which specializes in cuisine with a Mediterranean flair. While we've always just stuck to drinks at Marchand's before, last week we decided to check out the food at the restaurant as well. I'm glad we did. We ordered a sun-dried tomato and feta hummus to share and I also ordered two crab cakes. The combination of the feta and sun-dried tomatoes in the hummus was tasty and the appetizer included an array of fancy fresh breads for dipping in the hummus. My crab cakes came with scoops of a funky guacamole concoction on top of them, and were nicely done without much grease or bread crumbs. Marchand's is expensive, and choosing from the bar menu let's you enjoy the same good food at reduced prices. I asked the bartender about the Vinoy's Sunday brunch and she claimed it was "the best around." 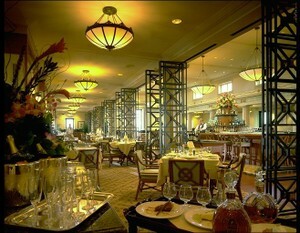 I'm sure the bartenders at the Don say the same thing, but I have heard that the Vinoy does a very nice Sunday brunch. We'll have to go back sometime and try Marchand's for a full meal. Note that Marchand's did well on its last health inspection report with only a handful of violations. So what's your favorite Sunday brunch restaurant in Tampa Bay? Bottom-line: If you're in downtown St. Pete sometime and looking for an interesting place to get a drink and some appetizers, the bar at Marchand's Bar & Grill inside the Renaissance Vinoy is worth checking out. Inspection Scorecard: Last Inspection - August 2006 - Violations - Critical (3), Non-Critical (2).